WineKeeper's top of the line, fully customizable unit, with the shallowest footprint. Optimize your wine storage with WineKeeper's Magnum - designed to cool and dispense red and white wines by the glass. A pressurized blanket of inert nitrogen protects the wine from oxidation, enabling you to enjoy your collection without it quickly spoiling. A specialized, forced air refrigeration system with automatic defrost provides increased temperature control and cooling capacity. The system maintains a temperature range of 42 - 65° F, and includes a movable divider wall that separates different temperatures for red and white wines. You can move the divider depending on how many bottles of red and white wine you want to dispense. The Magnum is our least deep unit-only 15" which is ideal for use on narrow, back bar counters. A minimum vented air space of 1" on each side, 3" behind, and 12" above the unit is required for it to run smoothly. Custom configurations are available. 8' remote nitrogen tubing with quick-connect. 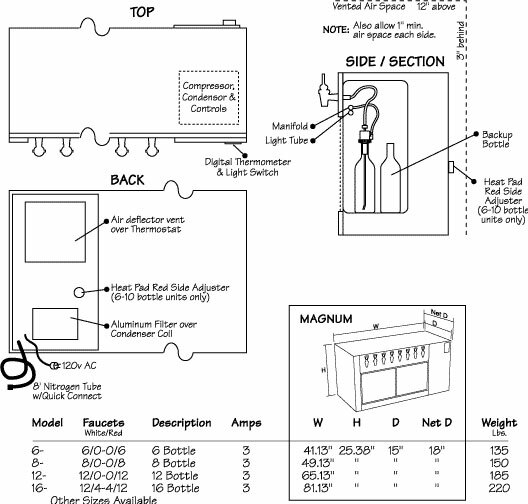 Refrigeration: auto defrost, 120 volt, 60 HZ., 3 amps. Temperature range is 42 to 65 F.
The required minimum vented air space is 1" each side, 3" behind and 12" above unit.